Sitting on grassland on high hill in San Sebastian overlooking the village of Garabandal, Spain, and in front of the thirteenth station of the cross where Jesus is brought down from His bed of death and laid in the arms of his hurting mother, I looked deeply into her eyes filled with such sorrow, such pain and wondered what she might have been thinking about, holding this now adult son of hers so still in death. So cold. This descent from the cross and Michelangelo’s Pietà fuse to become a visible symbol of the suffering which is attached to Mercy. What was this mother in agony thinking as her tears flowed onto her son’s cold, blood-smeared face and bloody matted and previously beautiful hair? What was she thinking, as she wanted to cover him with her mantle both to preserve his modesty and dignity but also to perhaps warm him up a little in the hope that he might wake up. What was she thinking? Was she remembering that unusual announcement of his life and then his birth? Was she remembering the little boy who played with the other children of the village? Was she remembering his life in the workshop with his father Joseph? Was she thinking of the times she watched him … just watched him. In wonderment. For no other reason than simply because he was her son. Was she thinking about the time when she and her husband lost him for a short while in Jerusalem? Oh, the terror of having lost her boy, but then they found him. Was she thinking about his care of her after Joseph left to sleep with the ancestors? And her tears rolled unabated. She cleansed his beautiful face with her tears while other friends helped her to hold him tight because after all he was a man now and heavy. Indeed here is her co-redemptrix work. Her Passion. Was she remembering that day in Cana when she knew with a heavenly knowing that it was “time” to let him go and do his Father’s work? He had been her dutiful son but now he must go about and do the work he was destined to do? And she told him to begin his ministry. It was the right time now, not when he was 12-years-old. Was she thinking about the words she heard him speak? Such strange words at times, “Blessed are those who sorrow,” he had said. Had he been thinking about the sorrow that was to come to her? But then again he is his Father’s son isn’t he? He knew. Was she thinking about the time they met along the journey to Calvary and looked deeply into each other’s pain-filled eyes? What was this mother thinking while holding her dead infant, boy, adult son in her arms and needing to clean his face and warm his body? Would that bring him back to life? If she holds him tight will that protect him because she so much wants to protect him since that’s what a mother does? She protects fiercely her child. In this remembering I see women who abort and do not protect the child, do not hold on tight so nothing will happen to him. This is what causes the pain. Not so much the dying but the manner of the dying: undefended, unwanted, not held, and the woman meets sorrow. The sorrow quietly haunts her because she has a need to remember him but cannot do so because his life is cut short. She weeps with the deepest sorrow. She longs to hold onto the baby she surrendered to death, as the true Mother held on. The abortive woman longs to wipe her child’s dirty face with her tears but she cannot because the child was ripped from her womb and disposed of as something unimportant: but the true Mother wiped her son’s face with her own tears, on her behalf. The woman longs to cradle her aborted infant and make sure nothing can ever hurt him, but cannot because already the hurt has happened. However, she can be comforted because the other Mother has cradled, in death, her own beautiful boy, on her behalf. The abortive woman longs to take back the child she rejected but cannot, though she can be comforted in knowing that there is a Mother who has already taken her child and held him and is holding him till they meet again. The new Mother holds and cradles him in her mantle, filled with love both for the mother as she walks with only a memory of her child, and the lost child. Just as she cradled her own beautiful Son and didn’t let him go. In the holding of her own Son in his death, the heavenly mother holds cradled in her arms all who perish on the new cross of abortion and the mothers who could not hold on to their children. 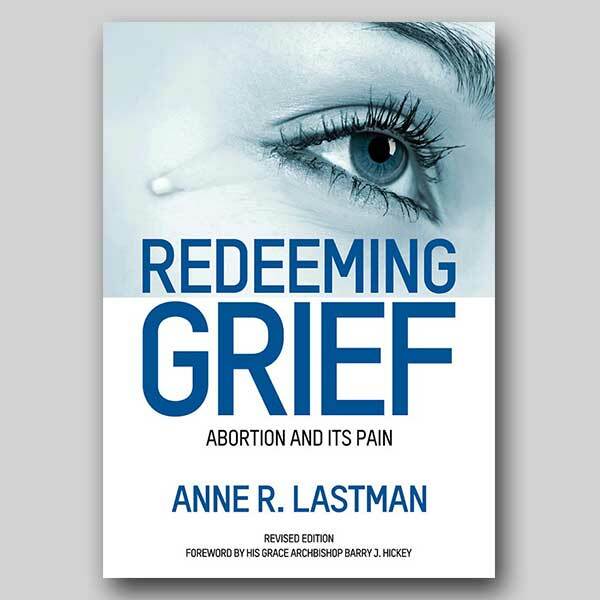 Anne Lastman, BA (Psy/Rel Stds) Dip Ed (Sec), MA Rel Ed, MTS, MACA, FVC, is the founder of Victims of Abortion and an Abortion Grief Counsellor (0408 175 033, PO Box 6094, Vermont South, Vic 3133).